The Eczema Battle - Call in the Cultured Troops! The Eczema Battle – Call in the Cultured Troops! High quality, unsalted cultured foods can help eczema (dermatitis) and a variety of other skin disorders for at the root of such conditions is often a gut flora imbalance and damaged intestinal lining. Cultured foods, naturally rich in probiotics, deliver loads of beneficial bacteria to the gut where they quickly colonize – crowding out the pathogenic bacteria, yeast, etc. living there. Not only do friendly flora keep bad guys “in check”, but also maintain a balanced inner ecosystem AND regulate hydrochloric acid secretions! When pathogens are allowed to multiply in greater numbers than good bacteria, they can do real damage to our intestinal lining – causing significant inflammation to this important part of our bodies. In this way, the skin is a useful gauge in showing the gut’s internal condition. For anybody suffering eczema, it is common to have multiple food sensitivities. When there is damage to intestinal lining, especially the small intestine (s.i.) any food consumed (even breast milk) is not properly digested and absorbed. The s.i. is where 95% of absorption of nutrients occurs, so if this tissue is inflamed then it’s likely that there are holes in lining (due to pathogens burrowing into gut wall). These holes allow partially digested food particles and toxins to leak into bloodstream. Once in the blood, these particles release an auto-antibody reaction from the immune system to attack foreign invaders. The corrosive nature of this acidic battle can create fertile ground for healthy tissue to become inflamed, which lowers immune function. The resulting symptoms are individual, and pronounce themselves in the weakest organs (due to genetics/existing health conditions). Symptoms can include asthma, allergies, arthritis, hives, and of course eczema. When the gut is weak, hard-to-digest proteins are often the first “allergens” to present themselves. This is because many proteins are also the most difficult of all foods to digest. Hence why nuts, gluten, soy, eggs, and dairy are some of the top food allergens. All said, removing such foods is not always the answer, though can be necessary (and very helpful) for a short period of time while the gut balances and heals itself…Something that is done with right foods, food combinations, and food preparation! Let’s Heal & Seal Our Digestive Tract! One of the best foods to “heal & seal” the digestive tract is probiotic-rich cultured foods. Made with high-quality culture starter* and NO salt, these natural probiotics deliver hearty strains of friendly flora to the gut where they implant themselves and work magic! Unlike most probiotics that die before even reaching the s.i. (due to stomach acid, fluoride, chlorinated water, antibiotics), the bacteria used in making cultured foods survive and thrive all the way to the gut where, given the right diet, they can multiply in great numbers and help you stay strong and healthy! These living foods are easy and affordable to make and are safe for all ages – even 2 day old babies. Eat cultured foods to support healthy digestion! My own family enjoys a wide variety of cultured foods, including: cultured vegetables, cow milk kefir and yogurt, juice kefir, young coconut kefir with pudding, cultured butter, whey, and various cultured condiments (ketchup, relish, chutneys, jams). I wouldn’t do without them as they have become a precious staple in our house. They are something I have come to rely on at the start and end of each day! Check out this article on Kissing Inflammatory Skin Disorders Away! Make Your Own Cultured Vegetables With Our Beginner’s Recipe! *A culture starter containing high-quality probiotics, particularly Lb. Plantarum – one of the heartiest strains you can put in your body – ensures a potent product that can help remove pathogens from the body and aid digestion. Unlike most forms of probiotics, that are easily destroyed by antibiotics, stomach acid, chlorinated water before reaching the s.i., Lb. Plantarum remains active and alive to keep you healthy and balanced. Click Here to purchase superior culture starter! 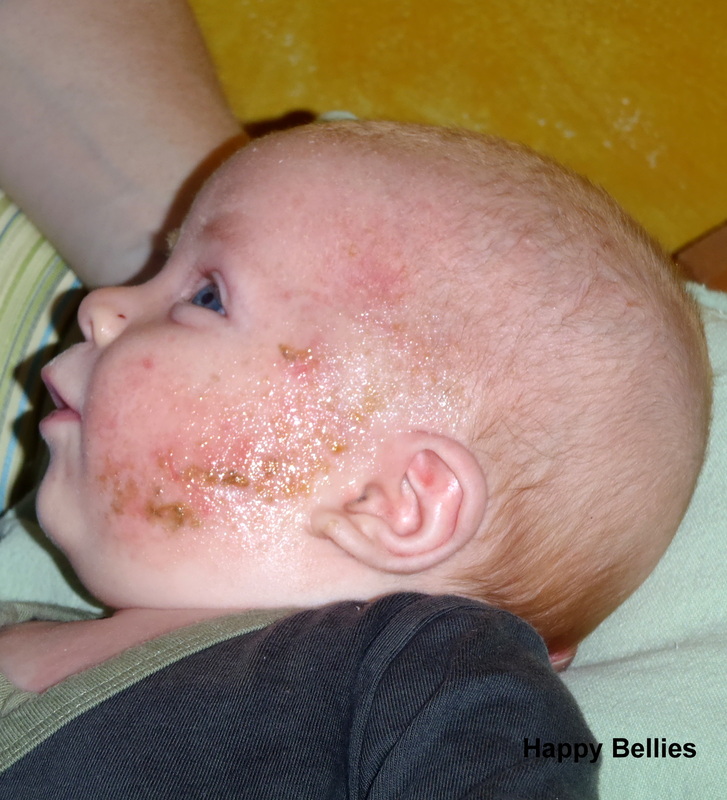 2 comments to The Eczema Battle – Call in the Cultured Troops!